[231 Pages Report] The global protective packaging market was valued at USD 23.14 Billion in 2016, and is projected to reach USD 32.02 Billion by 2022, at a CAGR of 5.67%. The base year considered for the study is 2016 with the market size projected from 2017 to 2022. The primary objective of the study is to define, segment, and project the protective packaging market size on the basis of type, material, function, application, and region. The study also aims at strategically analyzing micromarkets with respect to individual growth trends, future prospects, and their contribution to the total market. It also provides detailed information about the main factors influencing the growth of the market (drivers, restraints, opportunities, and industry-specific challenges). In addition to this, the study analyzes competitive developments such as acquisitions, new product launches, and expansions in the protective packaging market. The research methodology used to estimate and forecast the market size included the top-down approach. The total market size for protective packaging was calculated, and accordingly, the percentage was allotted to different sectors in each of the segments, which were done on the basis of extensive primary interviews and secondary research such as the International Flexible Packaging Group (IFPG), Protective Packaging World, Protective Packaging Magazine, and the Corrugated Packaging Council. Primary research involved in this report includes extensive interviews with key people such as CEOs, VPs, directors, and executives. After arriving at the overall market size, the total market was split into several segments and sub-segments. The data triangulation and market breakdown procedures were employed to complete the overall market engineering process and arrive at the exact statistics for all segments and sub-segments. The breakdown of profiles of primary respondents is depicted in the figure below. The market ecosystem involves various stakeholders in the protective packaging market. It starts with the raw material suppliers such as Smurfit Kappa Group (Ireland), Sealed Air Corporation (US), Sonoco Products Company (US), Huhatamaki (Finland), and Ranpak (US), which are the manufacturing companies of the protective packaging. The next level in the chain involves the assembly team that is monitored by the manufacturers such as Pregis Corporation (US), Pro-Pac Packaging (Australia), Storopack Hans Reichenecker (Germany), Dow (US), and DS Smith (UK). It is followed by the marketing and sales of the finished products, which is only possible if an efficient distribution channel is developed. Finally, the end products are distributed to the consumers. This research report categorizes the protective packaging market based type, material, function, application, and region. MarketsandMarkets projects that the protective packaging market size will grow from USD 24.31 Billion in 2017 to USD 32.02 Billion by 2022, at a CAGR of 5.67%. 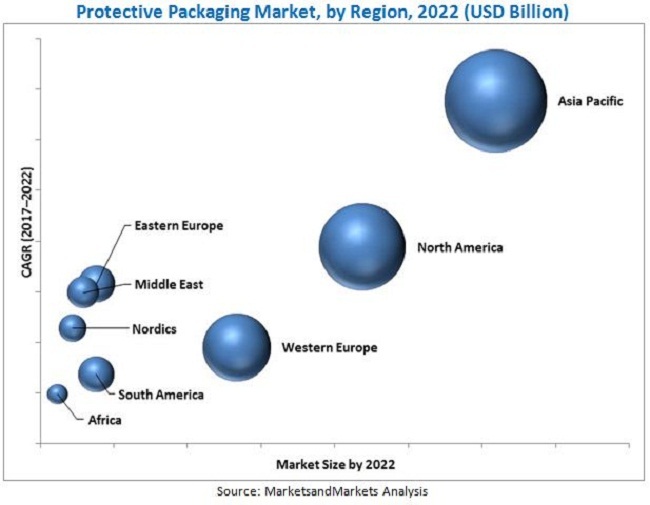 The protective packaging market is expected to witness high growth due to factors such as rise in the middle-class population, growth in demand from the food & beverage and healthcare sectors, and preference for convenient packaging. This report has been segmented on the basis of type, material, function, application, and region. On the basis of material, the foam plastic segment, which is projected to be the fastest-growing market during the forecast period, held the largest share in 2016. On the basis of function, the cushioning segment is estimated to account for the largest share in 2017, while the food & beverage segment dominated the applications of protective packaging in 2017. Both these sub-segments are projected to grow at the highest rates between 2017 and 2022, in their respective segments. In terms of value, the flexible protective packaging segment accounted for the largest market share and is projected to grow at the highest CAGR during the forecast period. This growth can be attributed to flexible protective packaging as it is among those innovative forms of protective packaging that help in terms of their ease of use and portability. Flexible protective packaging is cost-effective, environment-friendly, and provides good barrier resistance properties from damage such as shock and vibration. It also provides high clarity and excellent barrier properties to the products enclosed within. In terms of value, the foam plastics segment, by material, accounted for the largest market share, and is projected to grow at the highest CAGR during the forecast period. This growth is attributed to its application in almost all types of packaging variables, as it offers good thermal insulation and shock-dampening capabilities. 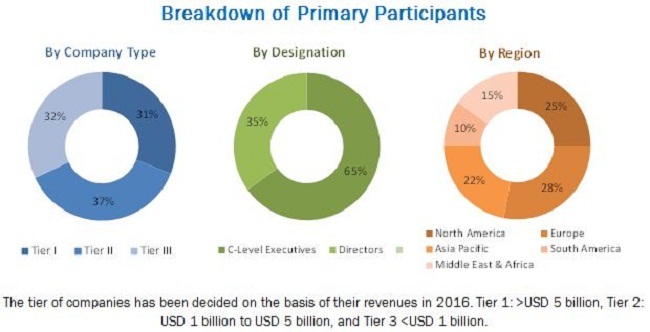 By application, the food & beverages segment is projected to grow at the highest rate due to the high demand for food & beverage packaging as it offers durability, product protection, and extends the shelf life of the product. Protective packaging for food & beverage products reduces the possibility of product contamination & damage. It also protects products from moisture, gas, light, and temperature. In 2017, the Asia Pacific region is estimated to account for the largest share in the total market for protective packaging, in terms of value, followed by North America and Europe, owing to manufacturers’ focus on developing low-cost protective packaging options. The Asia Pacific region is projected to register the highest growth during the forecast period; this is attributed to the large customer base for household appliances and consumer electronics, due to the growth in population in countries of this region; this, in turn, is expected to lead to the growth of the protective packaging market. The protective packaging market in the North American region is developed and matured; the markets in the US and Canada are projected to grow the highest rates from 2017 to 2022. High initial capital investments have caused an unfavourable impact on the profitability of the packaging industry. The global protective packaging market is dominated by players such as Smurfit Kappa Group (Ireland), Sealed Air Corporation (US), Sonoco Products Company (US), WestRock (US), Huhatamaki (Finland), Ranpak (US), Pregis Corporation (US), Pro-Pac Packaging (Australia), Storopack Hans Reichenecker (Germany), Dow (US), and DS Smith (UK). These players adopted various strategies such as acquisitions, expansions, and new product launches to cater to the needs of the protective packaging market.